One spot left. Dog Drool or Swamp Juice? Something more traditional? I cross back to the colas and peruse the shelves. Perhaps something that won’t send my heart twitching and sputtering. The Fizzary incites this type of indecision. Lining the store’s shelves are bottles running the full color spectrum that entice with fanciful labels and clever names. Carousel horses, pirates, sea monsters… do I care that the ultraviolet bottle of blue raspberry soda makes my teeth sprout cavities just by looking at it? Not really, because there’s a raspberry with sunglasses giving me a thumbs up on the label. And even if sugar- and rainbow-infused marketing doesn’t reel you in, nostalgia surely will: Experience the Past… One Sip at a Time. Bottles touting pure sugar cane and old-fashioned soda shop(pe) recipes are equally abundant. 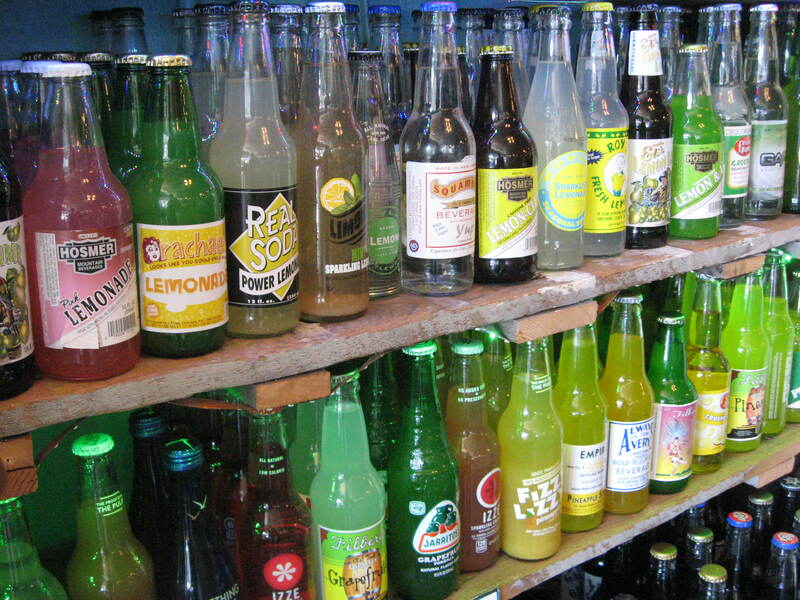 By far, the greatest amount of shelf space at The Fizzary is given to the perennial soda sweetheart root beer; a top seller, the Fizzary carries over 70 varieties. Along with the behemoth selection of Root Beer, the store carries soda in all manner of flavors, from standard favorites like Ginger Ale and Lemon-Lime, to those more suited to niche palates, such as Rocket Piss (a bitterscotch soda that glows in the dark), and Mr. Q Cumber (cucumber flavored soda), among other similarly bizarre sodas found in the “Uncategorizable” section. Accompanying Cherry and Grape in the soda fruit basket are unexpected flavors like Pineapple and Blueberry (not to mention delightful sub-genres including Sour Cherry and Cabernet Grape). 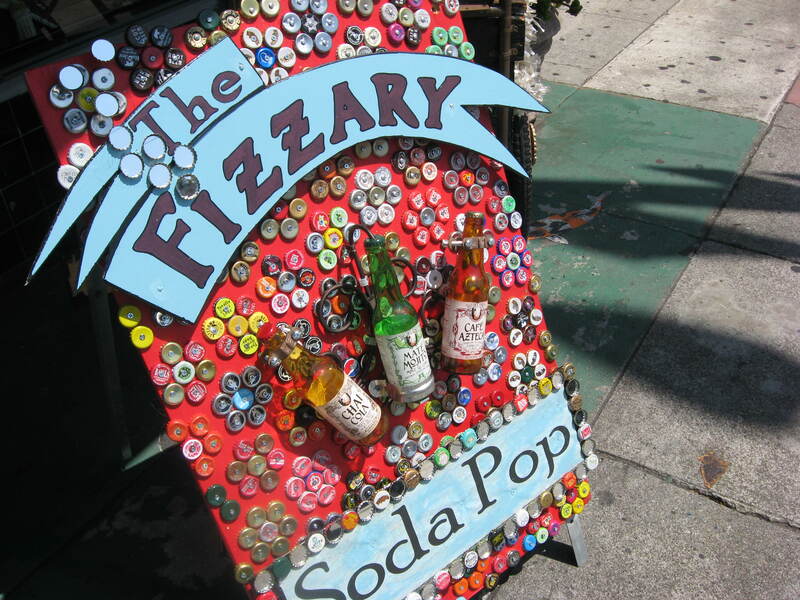 Since opening two years ago, The Fizzary has expanded to a second location on Haight Street, and has plans to include a soda bar in its original location on Mission where customers will be able to indulge in the soda version of “choose-your-own-adventure.” Although you can’t engage in mad soda-science yet, the Fizzary does have a bottle whirlpool for on-the-spot soda chilling and sipping. For each bottle purchased, customers get to select a piece of taffy from options almost as diverse as the sodas that surround them, including maple bacon, huckleberry, frosted cupcake, and Cap’n Crunch Berries. A gaggle of teen girls in candy-colored short shorts and ponytails swept up like an afterthought swarm the store as I continue roving the shelves for the right bottle to complete my six-pack. I admire their decisiveness as they quickly scan the rows and make their selections. Fluorescent pink cotton candy – spun sugar liquefied. Tangy ginger beer wrapped in a label scattered with palm trees. Chatting and chewing taffy, the girls leave the store as I head back to the Grape section. Swaddled in a crush of grape bunches, one bottle label’s tagline proclaims: “Da Flava is Da Vine.” The color of the bottled liquid is a wondrous purple that can only be achieved through the soda alchemy that is sugar and numbered food dyes. Sold! 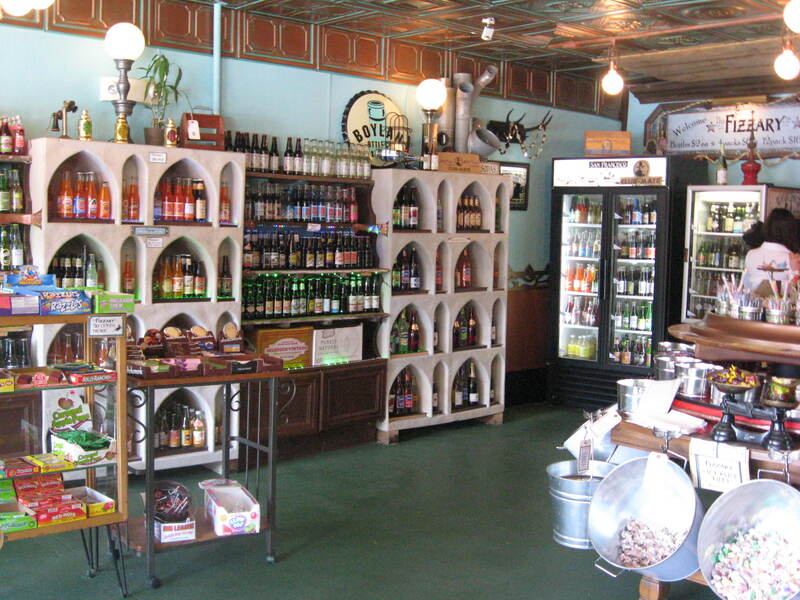 The Fizzary is located at 2949 Mission Street and 1782 Haight Street, and is open 7 days a week from 11:30am to 7pm.